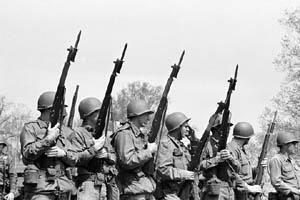 On May 4, 1970, National Guardsmen began shooting at protestors. But those students who were wounded and the family members to those who were killed had the many mixed feelings about the events at Kent State. The guardsmen also have some strong emotions about that day. Here are personal accounts from those students who where wounded and those who injured them. After being shot and sent to the hospital, Joseph Lewis expected some sympathy from his parents. But as a result of the events surrounding Kent State, his parents assumed that the National Guard must have had good reason to shoot their son. Because of the kind of media report that Kent was receiving, Joseph’s parents took in the information and blamed their son for anything that happened to him. Because of all the negative reactions that Kent had received, Joseph Lewis’ opinion of authority has lowered. He still believes that many truths were hidden in the headlines. After the events at Kent State, Jim Russell visited a friend for dinner. While they were eating, his father came home drunk and bellowed that the National Guardsmen should have shot more students at Kent State, including his own son. Jim was seen as a stigma and a political enemy of the nation, and because of this Jim’s father lost his job. After he returned to college, the college gave him his degree without all of the requirements because they wanted him off the campus. 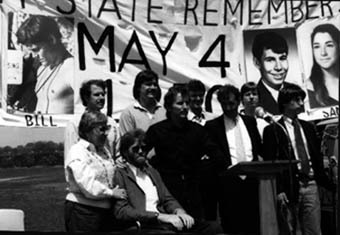 Tom Grace After May 4, Tom Grace felt that the events at Kent State became his identity and he began to regret it. 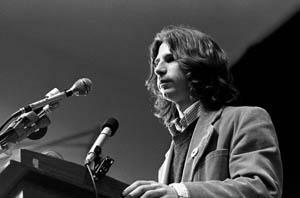 Although Tom Grace would often attend anti-war rallies, he only attended them to support those who arranged them. He now spends his time researching the events of May 4 so that he may one day give an accurate analytical account of that day. Although it is very hard for him, he also speaks around the country to high school students. Scott MacKenzie was only an innocent on May 4 and is still confused as to why he was shot on that day. Walking across campus from class, Scott saw the guards aim to shoot but he did not believe that they would have real bullets in their guns. He was shot in the back of the neck at the top of the spinal column and the bullet exited through his cheek. After that day, Scott has distrusted the justice system here in America. He feels that those accountable for the events were not prosecuted as they should have been. John Cleary only wanted one more picture on May 4 when he was shot in the chest. His parents were conservatives and felt that any policy the government made should be followed by the citizens. John had opposite feelings, and was very much against the war. To this day he still feels the guards had no reason to fire upon the students. After being shot in the back, Dean Kahler was put in a wheelchair. On that day he visited Blanket Hill with some friends from his dormitory. "Some people were talking about the -ism's of the day --communism, capitalism, imperialism. But I didn't know what that had to do with the invasion of Cambodia and when the National Guard was going to get off campus." The guardsmen drove the students into the parking lot, and Kahler threw a handful of gravel at them from about 100 yards away. Because he wasn’t going to hit anyone, he did not see the harm in throwing it. When the guards turned and fired, the one thing that Dean remembered was the shock on the faces of the students. He felt that innocence was taken away from the students on campus. Robert Stamps knew that he was at Kent at an electrifying time. After he was shot in the back on May 4, his hospital roommate asked him if he was a Christian. When Robert responded that he wasn’t, his roommate told him that that was the reason why he was shot. 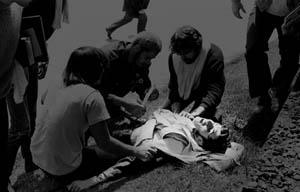 It seemed like all of the nurses and the doctors were treating Robert smugly because of his involvement at Kent State. 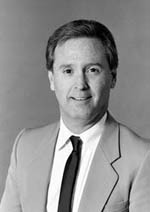 Described by his friends and those who knew him as quiet and smart, Doug Wrentmore is not spoken of often in reports and articles about Kent State. What Doug did do was allow himself to be interviewed by James Michener for his novel “Kent State: What Happened and Why”. Although his book was criticized for giving inaccurate accounts of the events at Kent, it was the first book that documented what happened on that day. After being wounded during the 13.5 seconds that the National Guardsmen were firing, Alan Canfora's main concern was his friend Tom Grace. Having always been active, Alan and Tom became best friends at Kent State. They both experienced a metamorphosis of their feelings on activism together, and were then shot together. Today, Alan Canfora is one of the most outspoken of the nine wounded students. He is currently working on a book concerning Kent State between 1967 and 1970. When campus authorities made the decision that there would be no rallies on the Kent State campus, the necessity for the National Guardsmen was apparent, for the students were assembling illegally. Charles Fassinger admitted that they came on campus without any plan of operation as to how it should be handled if the students became violent, but he contends that the guardsmen had adequate training and that they had been in crowd control situations before. The one thing that they had not been taught was how to deal with fear, something that could not be taught in the classroom. 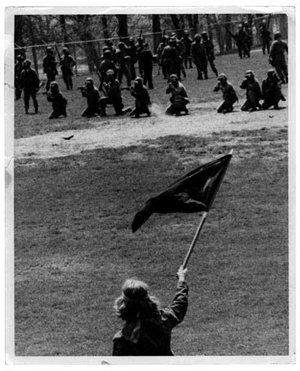 Although many felt that the guardsmen were young and not educated enough for Kent State, Fassinger wants everyone to understand that the students had a right to be afraid. Fassinger feels that if a similar event were to happen today, the NG probably wouldn’t be called in to a campus because opinions in the United States have changed so drastically. The horrible events at Kent State helped the government reconsider the way the guards should handle riots. 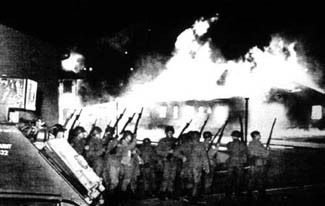 He stated that if such an incident where to occur today, the students would probably be allowed to continue in their demonstrations until they were finished. The horrific day led to the death of four young students at Kent State University. 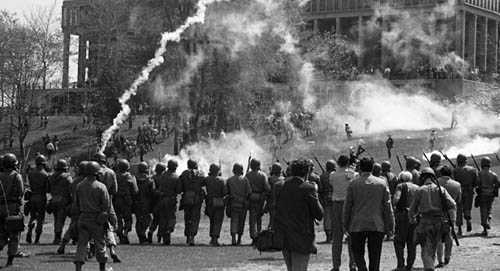 On May 4, 1970 students weren’t expecting to get shot at, and if injured, none of them expected to die. Jeff Miller was killed by a bullet through the head 275 feet away from the guards. Allison Krause was shot through the arm & chest 350 feet away. William Schroeder was shot in the back nearly 400 feet away. Sandy Scheuer was shot through the chest nearly 400 feet away.